[The] (re-)emergence of the problem of religion in art and art history... There is a differential intricacy of and an obverse complementarity between artistry and religiosity, art and religion, which, pursued in all its implications, would necessarily lead to a fundamental recasting of our entire understanding of both art and religion: a recasting wherein both these nominally and institutionally distanced practices are more importantly understood as different perspective upon a common concern - the nature of representation or signification as such. This is evident enough. Hence the inadequacy of art historical genealogies (like the one here being quoted!) that begin with Giorgio Vasari, or (even worse) Johann Joachim Winckelmann, instead of the iconoclastic controversy, not to mention the book of Exodus. What is far less evident is the truth of Preziosi's metaphysical claim casually embedded in said coda in the form of an insistence that religion is pure construction without remainder. "Religion," proclaims - no, preaches Preziosi, "is a mode of artistry which is in denial of (or is duplicitous regarding) the fabricatedness of its own inventions, commonly attributing that artifice to the 'design' of an immaterial, and (for sectarian believers) a pre-existent and originating force of being." Faced with such a colonialist caricaturization, why not let the subaltern (a "religious" person like David Bentley Hart, for example) speak? Religion in the abstract does not actually exist, and almost no one (apart from politicians) would profess any allegiance to it. Rather, there are a very great number of systems of belief and practice that, for the sake of convenience, we call 'religions,' though they could scarcely differ more from one another, and very few of them depend upon some fanciful notion [as Preziosi seems to assume] that religion itself is a miraculous exception to the rule of nature. Christians, for instance, are not, properly speaking, believers in religion; rather, they believe that Jesus of Nazareth, crucified under Pontius Pilate, rose from the dead and is now, by the power of the Holy Spirit, present to his church as its Lord. This is a claim that is at once historical and spiritual, and it has given rise to an incalculable diversity of natural expressions: moral, artistic, philosophical, social, legal, and religious. So no, there is no necessary conflict between acknowledging fabrications and having faith, between, for example, knowing that the gospels were actually written (how could they not have been?) and believing that God speaks through them truthfully, or between acknowledging an icon was actually painted and that the dead saint that said icon refers to lives. God, of course, is not a cause, not even a big cause - he is instead the premise of all causality, and his mysterious influence within the infinite network of causality that he inaugurated (even to the point of choosing a nation and donning human flesh) is called providence. "He is in essence outside everything," writes Athanasius, "but inside everything by his own power." So until Preziosi can produce a satisfying explanation for why there is something rather than nothing (he is welcome to try), his instinctual assumption against the possibility of immateriality will be no different in kind that an assumption for it. This is not to dismiss Preziosi as much as to point out an unfortunate inconsistency. He is, you see, one of the discipline's most deft deconstructors - a veritable suicide bomber embedded in one of art history's privileged professorial perches. In what is surely one of the better sentences of art historical writing in the last two decades, he writes that "Art [is] the very esperanto of European hegemony." 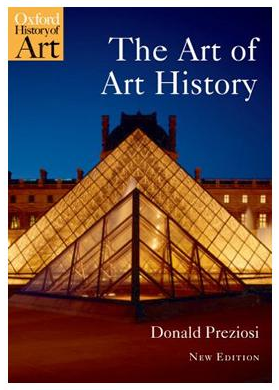 Preziosi admits that "the brilliance of this colonization is quite breathtaking: there is no 'artistic tradition' anywhere in the world which today is not fabricated through historicism and essentialism of European museology and museography...." Yes, art is hegemonic, and the world's teeming international network of monolithic museums prove it so. "Art history makes colonial subjects of us all." Why then continue to perform art history? That's a good question for another post. The point here is the unintentionally humorous one that an author who has (brilliantly, in my opinion) exposed art history's shallow roots in the stripped soil of the European Enlightenment, is tethered to that same Enlightenment's assumptions about "religion." "The essential 'secret' of religion," writes Preziosi (wait for it... drum roll please...) "is that there really is no secret at all that is separate from its alleged 'expression.'" But all this statement tells us, a statement so blithely broadbrush that the paint gets very thin indeed, is the essential secret of art history. This being that that the discipline's colonialist, European (and yes, white male) Enlightenment secularity has gone so blissfully unquestioned that it has survived two decades of deconstruction without so much as a scratch. Until now. Hence the recent publication string that questions such secularism; and hence Preziosi's need to (grudgingly?) acknowledge religion in the sweetspot of the discipline's chief initiatory document (the grad school reader). Donald Preziosi, then, is like a Moses of sorts. He has traced art history's repressed consanguinity with religion, and has traveled far enough to see the mountains of post-secular art historical research. The future (or at least one of them), he tells us, is in those hills. And yet, Preziosi is sufficiently hindered with his discipline's secular presumptions to be able to enter that land himself. As a result, even as he emblazons we religious people with a scarlet "R"... we still thank him.